With the increasing popularity of reality television shows that boast the thrill of hunting for a house internationally, have you considered being a trans continental realty owner? 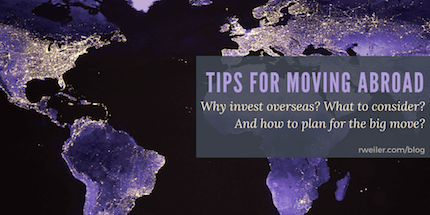 Below you’ll find several benefits to purchasing real estate abroad, as well as considerations and 10 tips on planning the move. Why Go Abroad for Trans Continental Realty? The cost of living abroad is astronomically lower. Invest in trans continental real estate now and make a profit over time; when you retire, you have more cash at your disposal to enjoy retirement abroad. Diversifying your investment portfolio is a good way to ensure your eggs are not all in the proverbial single basket. Earning an income abroad can be financially beneficial as the returns can surpass that of the American dollar. Did you know that travel expenses to your property for management purposes are tax deductible? Offshore investments are more protected from life’s little blunders. What type of property are you looking for (house, condo, duplex, apartment complex, etc.)? How much space are you looking to obtain on the property? Who will manage the property when you are not there? How much local convenience do you want? Do you want to be in a major city, outskirts, or in the country? Will it be a turnkey, renovation, or something in the middle? Are you looking to buy or rent? If rent, how much can you rent for in the area? Who will help you with the real estate brokerage overseas if you do choose to rent? If you would rather rent, do you plan to buy the property, eventually? Do you want the home to be furnished? Moving abroad can be a daunting project. A lot of planning and preparations are needed to ensure a smooth transition for everyone involved. Below is a quick list of essential items that need to be addressd when purchasing transcontinental realty, and then making the move. Perform as much research as possible about the country and region you are moving to. It’s important to understand the country’s history and culture, geography, general laws, and important public figures. Investigate the real estate laws in your chosen destination. And seek legal advice before purchasing the realty. Learn the country’s language; buy language-learning apps, CDs, DVDs, books, or even see if there are any language learning videos on YouTube. Make sure you have your passport, visa, and all related documents and paperwork organized. Gather all other pertinent documentation, including social security cards, birth/adoption certificates, marriage licenses, driver’s licenses, relevant health records, etc. If you’re on prescription medication, find out how you can continue obtaining refills in the country you are moving to. Compare services, rates, timeframes, and insurance coverage from multiple trans continental moving companies before deciding on one. If you are relocating with your pet, make sure you check the requirements of the destination country’s customs well in advance. Some customs require pets to stay in quarantine upon entering, for an extended length of time. Speak with your vet to administer the proper vaccinations, gather all the necessary medical paperwork, and obtain a pet passport. Aside from your furry family member entering the new country, you also need to make travel arrangements, such as flying or hiring a private per transportation service company. Most of all, ensure your pet stays as calm as possible throughout this transition; keep their favorite toy with them, make sure food, water, and treats can be easily accessed, and perhaps look into natural stress-relieving remedies. Set up your health care coverage in the area you are moving to. Find out whether any government-managed insurance is offered to you, and if you are eligible. Or you may need to get private insurance. Once you’re there, be open to new cultures, customs, people, and food! This probably seems like a no-brainer; after all, that’s why you’re moving to your new home, right? Immerse yourself, but don’t lose yourself. You don’t have to see and experience everything within the first week. Purchasing Trans Continental Realty: Make It Happen! In conclusion, a real estate investment overseas can bring you extra income and double as your retirement plan, so long as you cover all of your bases. Making it happen is all about adequate planning and having the right people with you for the journey. Your first step is searching for a certified continental real estate group; a brokerage group that has a Certified International Property Specialist (CIPS) designation is your best bet, as they have in-depth global real estate market knowledge and experience. with a and deciding on one to help throughout the process. Are you overseas now, and thinking of investing in real estate in in Columbus, Ohio or throughout Central Ohio? Give The Robert Weiler Company a call at 614-221-4286. We’d love to travel to a tropical island with you… ahem, we mean help with your trans continental realty needs in your move from abroad to Ohio.